Lexington, KY, June 18, 2013 – The Kentucky Horse Council is inviting anyone interested in building sustainable trails to a one-day Trail Building Class on August 24, 2013. This class is open to all non-motorized trail user groups, tourism and travel individuals, and anyone interested in building or maintaining non-motorized trails in their communities. The trail topics to be discussed will not be unique to horse trails, but are applicable for any type of non-motorized trail. The location of the class will be determined by the location of interested participants. No trail building experience is necessary. The class is limited to 15 individuals. Topics to be covered in this one-day class include: a discussion of trail environment in Kentucky; introduction of trail issues involving user groups, public and private lands; key features of good trail design, and less acceptable trail design; options to limit erosion through design techniques, and an introduction to trail tools and equipment. The class will involve a morning classroom session, lunch, and an afternoon session outside observing and discussing on a specific trail section. Registration prices are $45 for participants with a discounted rate of $40 for Kentucky Horse Council members. Registration fees include all materials and lunch. To be considered for the class, individuals must complete an online "Interest Form" at www.kentuckyhorse.org/trailbuildclass, to allow KHC to determine the best class location. This form must be completed by July 19, 2013. After the location is announced, interested individuals may register and pay for the class. Questions regarding this class should be directed to Ginny Grulke at 859-533-7002 or director@kentuckyhorse.org. With the opening of the Dawkins Line Rail Trail, horseback riders have another 18 miles of trails to enjoy the beautiful Kentucky scenery. The Kentucky State Parks, which will manage the Dawkins Line that runs through Johnson and Magoffin counties, have several other equine opportunities available to guests. There are five campgrounds suitable for campers with horses at Carter Caves, Taylorsville Lake, Dale Hollow Lake, Pennyrile Forest and Greenbo Lake state parks. The park system has equine trails at those five parks as well as at Green River Lake near Campbellsville. For those who need a horse, the park system can give you a ride at five parks that have horse concessions. They are: Carter Caves, Cumberland Falls, Kentucky Dam Village, Barren River and Lake Cumberland. These rides are offered on a seasonal basis. Rides usually last about 45 minutes and cost $18. The Dawkins Line is open to horseback riders, cyclists and hikers. The new trail features 24 trestles and the 662-foot Gun Creek Tunnel. Plans are underway to add another 18 miles to the trail into Breathitt County. Most little boys and little girls have imagined themselves among the characters of the Wild West. Few actually ever get to live that dream. But Davey “Doc” Wiser has. For the last 30 years, Wiser has ridden his horse in the annual re-ride of the Pony Express. He took a few minutes to talk to Lake Tahoe Action about living his boyhood dream. Lake Tahoe Action: Why do you do this? Wiser: Because I was born 100 years too late. I go on wagon trains. I ride Pony Express. I like riding horses. I like reliving the past. I like presenting it to all ages that are interested. Cowboys and trains will never lose their popularity. Many of us have an iconic image of the Pony Express; a rider galloping into a designated station, throwing the mochila over the next rider’s saddle and sending him on his journey to the next station designated on the planned route. It is a part of the romanticized lore of the American West. The reliance of young, hardy riders on fast horses towards a unified mission of mail delivery became the focus of the endurance of rugged American individualism of the Frontier times. It began in earnest in April of 1860 and ended with the completion of the transcontinental telegraph in October of 1861. A short yet exciting time in American history. IT'S NOMINATION TIME! Nominations are now open for Hall of Fame/Member, Hall of Fame/Equine, Pard'ners Award, Ann Parr Trails Preservation Award, and Volunteer Service Award. Visit the Membership Recognition/Awards Description page for more details. Nominations are due in to VP Michael Campbell by 8/1/13. After sustaining a serious head injury on December 30, 2012 in the Death Valley ride in California, surgery, and a long convalescence at his home in Nevada, 2009 AERC Hall of Fame endurance rider Dave Rabe returned to the saddle when he completed the 3-day Strawberry Fields Pioneer endurance ride in Utah on June 21-23. Fellow endurance riders were delighted to see him back on the trails (marking trail, competing in the ride each day, and then unmarking trail), and wearing a helmet, a new part of his traditional attire (shorts and 'wife-beater' Tshirt, no matter the weather). Dave's nickname used to be "Hosebag," but it was affectionally changed to "Crackhead" since he cracked his head while not wearing a helmet. Dave's lifetime endurance mileage now stands at 56,800, and the endurance community is thrilled to see that number will continued to grow for a long time. Just guide 2 friends to join and your next ride is FREE! 7/15/13 is the cut-off date to be eligible. All they need to do is go to http://www.actha.us and click to join! When 2 join, recognizing you, a credit for a free ride magically appears in your account! Ride anytime, anywhere, any division. Get 4 friends and you get 2 free rides! It's that easy! You win, your friends win. Most importantly the horse wins! C'mon and take a free ride! Call your friends right now!! It's so much fun taking an ACTHA ride with your friends! Yesterday, June 15, my husband Pete Praetorius and I embarked on a four-month horse trek that will take us from northern Colorado to (at least) northern Montana. We’ll ride our two Icelandic horses (named Raudhetta and Siggi) and pack a third (named Signy). We’ll be accompanied by Rainbow, our 12-year old Montana cattle dog/husky mix. This trip is the second part of an ongoing adventure. 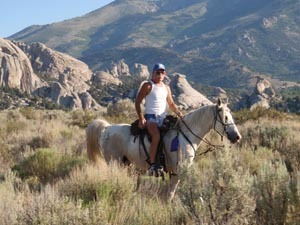 I determined that I wanted to do long-distance horse trekking in August 2003, shortly after bicycling solo from northern Montana to southern New Mexico. Afterward, I told Pete that it would be equally fun to do this route on horseback. 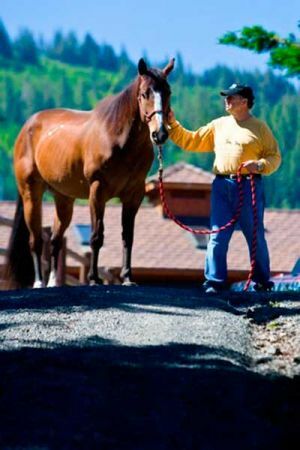 The Horse: Your Guide To Equine Health Care and TheHorse.com staff garnered seven media honors in the American Horse Publications annual awards program, held Saturday, June 22, at the organization’s annual seminar in Colorado Springs. Additionally, the judges awarded honors to several other Blood-Horse Publications products during the award presentations. A full list of awards received is included below. The awards recognized work completed in and dated 2012 for both print and online categories. A total of 104 AHP members entered a total of 758 entries for this year’s awards, and 177 awards were presented to the finalists for first, second, third place, or honorable mention. Sixty-three members were finalists. Also in print, The Horse won third place in the Equine-Related Editorial Series class for the magazine’s “Creepy Crawlies” articles, which Stacey Oke, DVM, MSc, authored. Judges noted the three pieces, which focused on various threats in horses’ environments, were very educational. As the leader in protecting our right to ride horses on public lands, Back Country Horsemen of America is proud of their record of service. For 40 years, they have volunteered their time, skill, and resources towards keeping trails open to horse use and promoting responsible recreation in a myriad of ways. BCHA commends its members across the nation who continue to make public service a priority, despite economic and weather-related difficulties. In fact, 2012 was their best year yet, with a total of $12,515,563 in annual volunteer value donated; the highest in the history of the organization. Is There Anything They Don’t Do? What can twelve-and-a-half million dollars of sweat, skill, and time do? We’re glad you asked! As they have every year since 1973, BCHA’s now 13,000 members from over 185 chapters and affiliates in 26 states spent the last year clearing trails of deadfall after storms, repairing gates and fences, building bridges, hauling gravel to fill washouts, and creating new trails. In order to protect our enjoyment of wild lands by horseback, they attended public planning meetings, assisted land managers in making important decisions that affect all trail users, and wrote to people at the state and federal level who make legislative decisions. But their goodwill isn’t limited to the trails. BCHA folks also invested many hours in educating adults and children in responsible recreation practices, packing, trail riding, and trail cooking. They participated in food drives, restored historic trail structures, picked up litter, and transported fish for stocking. Throughout 2012, Back Country Horsemen of America has been following up on their work with the US Forest Service trail classification system. In 2005, BCHA was forced to file suit against the USFS for failing to seek public input before developing a new trail classification system. This new system immediately and arbitrarily downgraded 59% of our trails to a level below equestrian standards. It changed the standards for time-tested horse trails that have evolved over nearly a hundred years. A federal judge ruled in favor of BCHA, allowing the US Forest Service to keep their new trail classification system as designed, but preventing them from assigning a trail a new classification without public input on the proposed change. Across the nation, BCHA members donated many hours attending meetings with USFS representatives to see how each Forest or Ranger District has implemented the new trail classification system in their area. For example, in the Willamette National Forest in western Oregon, most of the 173 trails that had been categorically downgraded from pack and saddle stock standards to bike and hiker only standards have been reinstated. The trails will be managed for other uses in addition to stock, but they must continue to be managed to include horses. Any trail work will be expected to meet and maintain design standards for equestrian trails. Last year, as every year, Back Country Horsemen of America kept a strong focus on trail maintenance. In June, the San Joaquin Sierra Unit of Back Country Horsemen of California spent a number of days camped in the Sierra National Forest, clearing Edison Lake area trails designated for maintenance by the USFS. The 22 person work party, including seven hard working women, divided into two groups. Collectively, the groups cleared over 15 miles of trail, removing more than 60 trees from the Goodale Pass Trail and the Graveyard Meadow Alternate Trail. Starting out from camp each morning, the crew rode the trail until coming upon a downed tree. After tying up their horses, they put on safety gear and pulled out their cross-cut saw, bow saw, loppers, hammer and wedges. Some trees also required the axe or the peavey. As the group worked, one crew member walked ahead to clear as much as possible by hand, then came back and reported to the others how far ahead the next work site was. On the Graveyard Meadow Alternate Trail, the crew found many groups of downed trees pinned by a larger uprooted tree. These can be very dangerous to remove and called for careful planning in order to be cleared safely and efficiently. The skilled and experienced BCHC volunteers accomplished this with no injuries or mishaps. The folks at Back Country Horsemen of America know that children truly are the future of our country, and too many of them never have the opportunity to meet a horse. In August, the Mountain Riders Chapter of Show-Me Missouri Back Country Horsemen teamed up with the Douglas County Fox Trotters and the Ava Area Frontier Girls to change that for one group of girls aged seven to ten. Held at the Ava Saddle Club, Get To Know a Horse Day paired each girl with her very own horse and its owner for the day. The girls learned how to safely move and work around a horse, how to brush a horse, check its hooves, and properly put on a saddle. With the horse owner’s assistance, each girl rode her horse, which was the first time several of the children had sat on a horse. The girls also learned about basic horsemanship and the principles of Leave No Trace responsible recreation. The day was designed to help these Frontier Girls earn a Merit Badge in Horsemanship. They went home with pink Show-Me Missouri Back Country Horsemen T-shirts, notebooks of information on horses, and huge smiles on their faces. The year 2012 was certainly a good one. 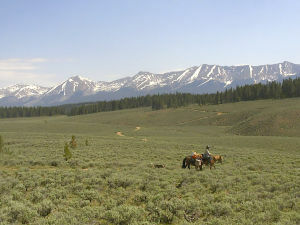 In the years to come, Back Country Horsemen of America will continue their work in maintaining trails, ensuring the USFS trail classification system is fairly implemented, teaching others about horses and responsible recreation, and the countless other ways they protect America’s heritage of traveling through our wild lands by horseback. 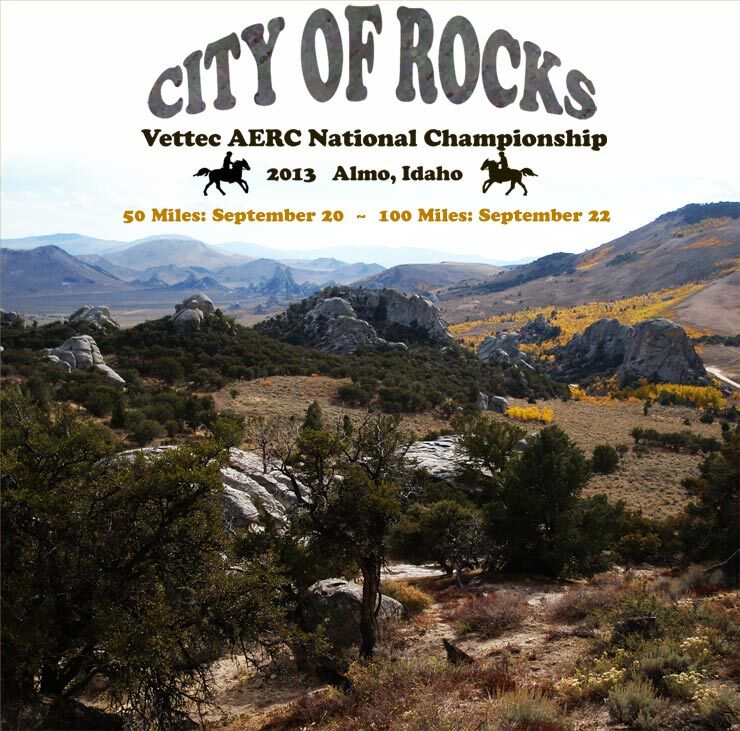 Rick and Carol Brand of Lost Juniper Ranch are the latest Bronze Sponsors of the 2013 Adequan AERC National Championships in Almo, Idaho on September 20-22. The Brands will be taking on the tremendous responsibility of all the water sets for horses at Ridecamp and along the trails, which will run in and around the City of Rocks National Reserve. Lost Juniper Ranch is located in Oreana, Idaho, and is a dealer for Specialized and Timberline saddles and occasional endurance prospects. Postmark your 2013 Tevis Entry by June 17th to secure your entry at the $350 price. On June 18th the entry price goes up to $450. Don't miss out on the discounted price! Click HERE to for the entry. June 24th is the postmark deadline date for seeding forms that will be considered. Please submit the form with information on you and your horse's record of rides completed together during the past year (if you do not have a record of riding together, submit the horse's record instead). If you do not send in a fully completed seeding form, you will not be considered to start in Pen 1. Click HERE to for the seeding form. About 20 years ago, I attended my first endurance ride in Pemberton. We loaded our QH/Arab mare into the stock rack, the girls into the jump seat of the truck, and headed over the Duffey Lake Road to the ride site. I had no idea what I was getting into at that ride, or that I would keep on going to long-distance horse competitions for so many years… that I would be totally hooked by the sport! A chestnut mare went missing on the Tevis trail along the Middle Fork near Poverty Bar on Wednesday, June 12. Horse and rider parted ways at the Tevis river crossing. Rider got scraped up but is okay, but the horse hasn't been seen since late afternoon 6/12. The horse was located via GPS cell signal between Poverty Bar River crossing and a bit downstream of Maine Bar, could be on either side of the river. There are three significant trail projects that need attention prior to the running of the Western States Trail Ride on July 20th. The Trail Committee would really appreciate an influx of volunteers to complete these projects. El Dorado Canyon - Greg Kimler needs a crew to join him in performing brushing and removal of duff and debris that has sloughed onto the trail. All tools will be provided. All you need is good walking boots, work gloves and drinking water. This work will be conducted during the week, so as to avoid the higher trail usage periods on the weekends. Please e-mail Greg at echovalleyranchinc@yahoo.com your availability. Granite Chief Wilderness – Phyllis Keller will lead a crew to prune back the regrowth that has occurred since the Western States Run traversed the trail on June 29th. You’ll travel in on your horse, and you will need to bring along a good set of pruning shears. This will also be a great chance to see the trail when not in a hurry on race day, and take in some great views of the Tahoe Basin. Please e-mail Phyllis at phylliskeller@sbcglobal.net with your availability. Highway 89 Crossing –Marc Van Zuuck will need two crews to assist with trail work on both sides of Hwy 89, south of Truckee. The work will take place on Saturday, June 29th, and involves trail bed clearing and some brushing. Please contact Marc at marc.vanzuuk@fire.ca.gov for more details. What better way to spend a gratifying day, than volunteering to ensure a successful ride for all of the Tevis Riders in 2013. This ride doesn’t happen without the wonderful volunteers. So show your support and contact these project leaders to commit. The drive past the cast iron gates down the 1/4-mile entry into the Mustang Mountain Ranch is often the best part of Chuck Cowan’s day. “When the sun’s out and it hits all the trees along the driveway, that’s one of the prettiest places on Earth,” the ranch owner said. After time spent first in the Army, then operating a successful heavy construction consultation business for the last 15 years, Cowan decided he wanted to get back to his roots. Over 53 acres in Yacolt, Cowan and his wife Annette have created a refuge for horses, with everything from riding trails to grazing pastures, a massive indoor competition-style riding arena, grooming bays, and riders with a guesthouse, fitness center, lounge and RV park. After a stellar month of rides and ride attendances all over the USA, ACTHA and its devoted ride hosts were able to donate $22,015 in cash to charities across the United States. "This wonderful phenomenon happens month after month at ACTHA and has for 5 years now. We believe our business model is the key and hopefully will set a standard for any others entering our space. The solution to the unwanted horse will not just evaporate. It will take the collective power of our industry in support of each other to eradicate the injustice done to our historical servants and friends. We're just one small grass roots company making our contribution by providing the trail rider with enjoyable week end experiences and giving their riding a purpose. We are very thankful to have been embraced by so many other companies that see not only the chance to help but also see the business opportunities. ACTHA simply channels as much as we can of this generosity generated from our hosts, members, our thousands of incredible volunteers and our sponsors to the charities we serve. All the while chipping away at the leading reason for the unwanted horse; unemployment" states Tom Scrima ACTHA's GM. ACTHA's plan is simple. Individuals from anywhere in the US or Canada apply to put on an ACTHA event. There are two types to choose from. Competitive Trail Challenges (CTCc), very casual and educational and ACTHA's Obstacle Challenges (AOCs). The first, CTCs, take place over a 6-8 mile trail ride while the second, AOCs, take place in an open field or arena. "This way we can serve every region year round" states Robin Tilghman, Director of Marketing. Ride hosts can repeatedly put on ACTHA events after considerable training. The funds earned can be applied to personal expenses or those of their club, organizations or favorite charity. Many opt for a charity but regardless ACTHA donates from every event approximately 20% of its gross rider entry income to charity. The actual charities that ACTHA sends its share of funds to are actually selected by the ride host from a list of hundreds of approved ACTHA charities. Big and small. This way no matter what every ride host gets firsthand knowledge of what is being accomplished and they come back for more. Some hold as many as 10 events per year. "One of the favorite things about my work for ACTHA and the Cause happens every Thursday” states Ann Kinsey, Director of Operations. "First I cut checks to all the ride hosts who have submitted for payments from the last week's events. I send the check directly to them or the charity they have represented. And then I send another check directly from ACTHA to one of our listed charities. I don't know where else I can get this thrill and get paid to do it! The letters of appreciation we get every week chokes me up. It never gets old." ACTHA is well on pace due to their marketing and pacts with major entities like the Unwanted Horse Coalition and Horses 4 Heroes to hold over 1,000 events per year. The role of ACTHA sponsor's is a critical component. Cash is not required to be an ACTHA Sponsor. Rather ACTHA becomes a meaningful sales outlet to those seeking the elusive trail rider market. Each sponsor offers their products for 15-25% discounts to ACTHA members. " It's really refreshing to see a company like ACTHA knock on my door with a win win proposition versus the typical asking for cash donations that we lose visibility of. ACTHA has become one of our largest outlets for sales. The discounts come back to us as happy customers order more and more of our creations". So state's Molly's Custom Silver, another seasoned ACTHA sponsor. Sponsors that don't sell to the public directly can adopt one of ACTHA's many Medal programs such as the Diamond In The Rough Medal sponsored by Mountain Horse. This medal is given to horses who have found their way into ACTHA from a rescue category. It is awarded for excellence in performance and receives, in addition to a beautiful medal donated by Hodges Badge, a stunning Devon embroidered jacket from Mountain Horse ( retail value approximately $200). ACTHA is happy to share its business plan with any company wanting to join the cause of full equine employment.